MY GOD it would have been glorious to have Tumblr when I was 14. It's a fangirl paradise. 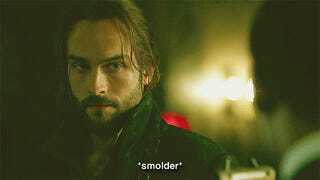 I searched for "Ichabod Crane" as I was watching Sleepy Hollow and I was down the rabbit hole for half and hour. Do you GroupThinkers have Tumblr accounts? EDIT: I don't know if you can see the gif. Kinja seems to possibly be on drugs. EDIT 2: missfausse.tumblr.com . If you'd like to find me or whatever.